This link will take you away from this site Please be aware that we do not necessarily endorse or support the views, opinions or expressions of this site. 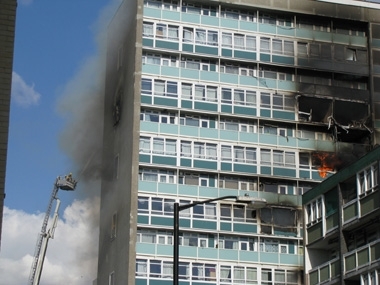 The fire begins at 4.10pm on Friday 3 July inside a flat on the ninth floor. There are no communal fire alarms or sprinkler system in the building, which was built in 1959. The fire brigade is called at 4.19pm, assistant commissioner Nick Collins said firefighters were at the scene within five minutes and started tackling the fire ‘immediately’. 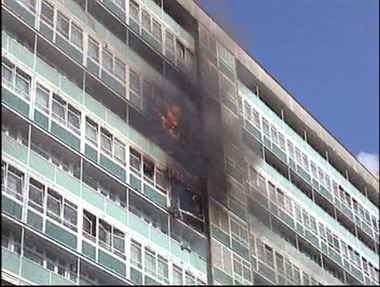 The fire quickly spreads to Flat 79 on the 11th floor. Catherine Hickman, 31, a fashion designer, is later found dead in this flat. The central stairwell, the only way into or out of the building, begins to fill with thick black smoke. Firefighters set up an operational command centre on the seventh floor; dozens of 999 calls are received, many of them from residents saying they are trapped. Flats on the seventh and fifth floors can be seen with their windows open (circled, above). The 92 flats in Lakanal House are arranged in an interlocking ‘scissor’ split level design; a typical floor plan is attached to this estate agent’s advert, the plan for a Sceaux gardens block can be seen in the AJ’s original 1960 building study. 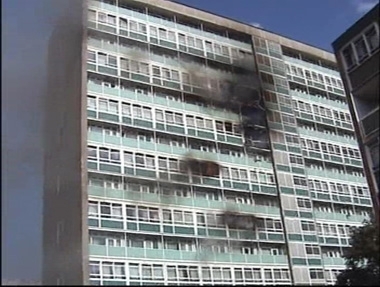 Although neighbouring floors appear unaffected, smoke is soon seen at this fifth floor window. 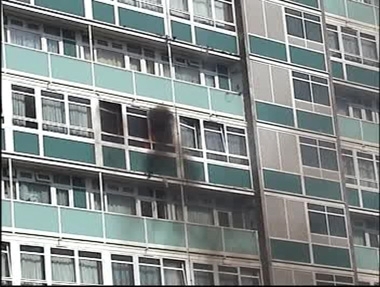 Architect Sam Webb - an expert in assessing the risks of post-war social housing - speculates that molten material fell from flats above and spread the fire, probably by igniting curtains. 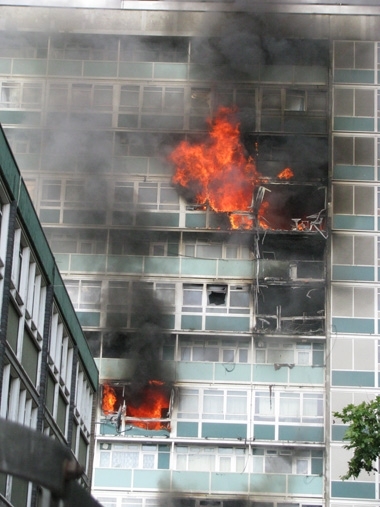 He said: ‘This is a very serious fire with very serious implications.’ He claims that all facades and window frames were replaced with flammable uPVC, but this is flatly denied by a Southwark council spokesperson: ‘They are all metal in that block’. As the fire rages at higher levels smoke begins to appear from the flat on floor six. With fires both above and below the operational command centre a decision is taken to re-locate to a safe area on the third floor, below the seat of the fire. Nine special fire rescue units are dispatched to Lakanal House. A total of 18 fire engines and more than 100 firefighters respond to the inferno. In this image, with the engine ladder apparently at full extension, firefighters attempt to dampen the flames. Residents would later complain that fire crews did not have ladders long enough to reach the 11th floor. 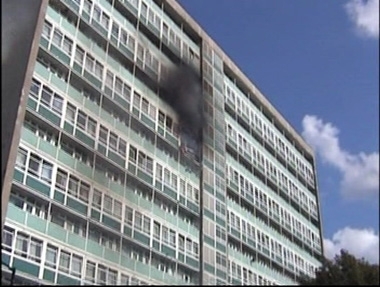 A spokesperson for the fire brigade said such criticisms were a ‘red herring’ as some tower blocks are too tall for any ladders to reach. Inside the building, fire crews work their way upwards from the lower floors, checking every flat on the way. More than 40 residents were rescued, of whom 15 were treated in hospital. There are reports that firefighters are ordered to withdraw from the building after reaching the 11th floor amid fears of an explosion as a large gas pipe has fractured inside the block. Assistant commissioner Nick Collins said: ‘Some of the firefighters went back in three or four times. They were working at their very limits. We are extremely proud of them. This was a very serious fire, particularly on the 11th floor. It did take us longer to get to the 11th floor but it was not for lack of trying. Helen Udoaka, 34, her three-week-old daughter Michelle and Dayana Francisquini, 26, her three-year-old son Filipe and her six-year-old daughter Thais all died after being overcome by smoke while sheltering in Francisquini’s 11th-floor bathroom. ‘My best friend [Dayana Francisquini] died and I would like to know why, when she tried to come down the stairs, firefighters told her to go back to her bedroom. ‘I told firefighters and police that she was in there and pointed at her flat and no one went to get her. ‘The trauma that has come out of all of this is almost indescribable. Knowing the people we were in there together with died, we could have stayed in there. ‘I did not go outside to try to get away myself. I went out to do something, to be ready when the need arose. ‘Because of the fireball I saw I had to do something. Obviously it’s very traumatising and I’m still trying to come to terms with that. ‘They were what I lived for. Now everything is gone and I have nothing. My children were angels to me. I’ve lost my babies and my beautiful wife. They died together and I want to get them together and fly them home to Brazil where they can all be buried in the same grave. When I die I’ll be buried there too. I am particularly interested in this so sad story because it may be yet another case of problems caused by safety processes demanding counter-intuitive behaviour from occupants, which in a crisis no one would obey. I covered a not dissimilar fire for the AJ 35 years ago when those killed were cornered in their (balconied) bedroom, having allowed the fire to come between them - who had instinctively moved to the building's edge - and the escape stair - instinctively felt as a dark, enclosed, unsafe place. Here, it seems people also died in a bedroom. Yet, if the flats today remain as in the AJ 1960 plans you published, there is nowhere less safe as a shelter than a bedroom. Fire in the two lower flats seem, as your photos and Sam Webb suggest, lit by windblown debris from above; but how did it move upwards, from a bedroom next to a services duct and the liftshafts, two storeys to the next bedroom so speedily and disasterously? I hope attempts find useful answers drown out recriminations and inflamation of other occupants' understandable fears. I agree with John McKean from personal experience. 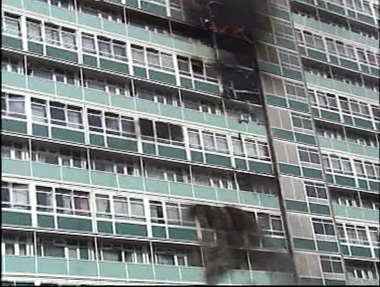 I remained in the safety of my own home as instructed by the fire brigade on the 24th floor of a single-stair tower in the East End while a flat three floors below became an inferno and eventually burnt out. Having said that, the fire was on the opposite side of the block to my flat, and the fire brigade did evacuate all flats above the fire source. However, many other residents did behave more 'intuitively' and take the escape stair and quit the building until the fire was out. I am always saddened and frustrated to learn of tragedies such as this, as there are a great variety of fire escape systems available (including systems which will save those even above the crucial seventh floor). The use of these, however, is hampered by rules, regulations, and the belief that a single internal staircase can always be used in the event of a serious fire. It would seem from the photos that the fire developed via the bedroom levels, jumping the escape balcony levels. Each flat had three directions of escape, two escape balconies and one central corridor, all via the central staircase, which I assume had fire doors. 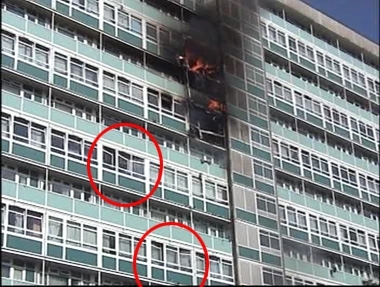 The spread of fire would appear to have jumped floors via the bathroom ventilation shafts which are the only connecting vertical voids between units. There seems no other logical reason for the fire break out on alternate floors. (as indicated on the photographs) Is it possible that residents did not understand the alternatives routes for escape? The bedroom floor if my supposition is correct would have been the least safe floor to wait. Is it possible that the escape balconies were not left clear, and were blocked with tenants belongings. If the fire brigade prevented people to use the central fire escape that obviously could have compounded the problem, the safety of bedroom may well have been the incorrect advise if my theory is correct. I would like to have seen the buildings fire risk assessment and find out if any of the issues that led to the spread of the fire were identified.